The IANTD Expedition Trimix Diver is the highest level of diver certification offered. With this certification you will be certified to make dives to 120 msw (400 fsw). Viewed as the pinnacle of CCR diving, the Expedition CCR course covers the skills necessary when undertaking deep expedition level dives. 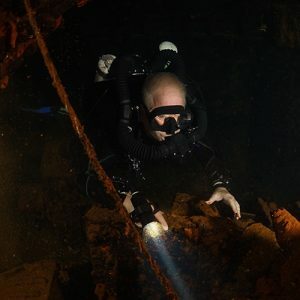 The program covers advanced decompression theory, including the use of habitats where appropriate, equipment management, team management, gas planning and support diver training. The course can be integrated with DPV training or any other skill set if required. Other aspects such as First Aid training and O2 provider courses can easily be added in to the program. This is a 5-day course with 5 dives. This program is designed to train OC or Rebreather Divers already involved in deep diving activities to more safely conduct exploration dives requiring extended decompression profiles and helium-based gas mixture. How deep can you dive with the IANTD Rebreather Expedition Trimix Program? Rebreather Expedition Trimix Diver Programs may be conducted to a maximum depth of 400 fsw (120 msw). Must be a minimum of 21 years of age without guardian approval. Must provide proof of a minimum of 100 Rebreather Dives including 50 Rebreather Trimix Dives and a total of 300 dives between OC and RB.